The antibodies from the mothers are passed to the babies through the placenta when they are born. These antibodies give them protection against certain conditions. Breast milk also gives additional antibodies to the babies after birth. But, the protection they get from these antibodies is temporary. Vaccination or immunizations help the child to protect against certain diseases. It works by creating immunity using small amounts of weakened or killed microorganism that causes certain diseases. These microorganisms can be bacteria or viruses. Weakened or attenuated live viruses- Vaccinations for measles, rubella and mumps are done using these viruses. Inactivated or killed viruses- It is used in vaccines like IPV. Toxoid Vaccines: It contains an inactivated toxin produced by the bacterium. Conjugate vaccines: It contains proteins and parts of bacteria. Vaccination at birth means as early as possible within 24 to 72 hours after birth or at least not later than one week after birth. Whenever multiple vaccinations are to be given simultaneously, they should be given within 24 hours if simultaneous administration is not feasible due to some reasons. Any does not administered at the recommended age should be administered at a subsequent visit, when indicated and feasible. The use of a combination vaccine generally is preferred over separate injections of its equivalent componenet vaccines. When two or more live parenteral/intranasal vaccines are not administered on the same day, they should be given at least 28 days (4 weeks) apart; this rule does not apply to live oral vaccines. If given <4 weeks apart, the vaccine given 2nd should be repeated. Vaccine doses administered up to 4 days before the minimum interval or age can be counted as valid (exception rabies). If the caccine is administered >5 days before minimum period it is counted as invalid dose. Any number of antigens can be given on the same day. Changing needles between drawing vaccine into the syringe and injecting it into the child is not necessary. Different vaccines should not be mixed in the dame syringe unless specifically licensed and labeled for such use. Patients should be observed for an allergic reaction for 25 to 20 minutes after receiving immunization(s). When necessary, 2 vaccines can be given in the same limb at a single visit. The anterolateral aspect of the thigh is the preferred site for 2 simultaneous IM injections because of its greater muscle mass. The distance separating the 2 injections is arbitrary but should be atleast 1 inch so that local reactions are unlikely to overlap. Although most experts recommend “aspiration” by gently pulling back on the syringe before the injection is given, there are no data to document the necessity for this procedure. If blood appears after negative pressure, the needle should be withdrawn and another site should be selected using a new needle. A previous immunization with a dose that was less than the standard dose or one administered by a nonstandard route should not be counted, and the person should be re-immunized as appropriate for age. Administer monovalent HepB vaccine to all newborns within 48 hours of birth. Monovalent HepB vaccine should be used for doses asministered before age 6 weeks. Infants who did not receive a birth dose should receive 3 doses of a HepB containing vaccine starting as soon as feasible. The ideal minimum interval between dose 1 and dose 2 is 4 weeks, and between dose 2 and 3 is 8 weeks. Ideally, the final (3rd or 4th) dose in the HepB vaccine series should be administered no earlier than age 24 weeks and atleast 16 weeks after the first dose, whichever later. HepB vaccine may also be given in any of the following schedule: Birth, 1, & 6 months, Birth, 6 and 14 weeks; 6,10 and 14 weeks;Birth, 6, 10 and 14 weeks, etc. All schedules are protective. Many people still are confused about vaccinations. Most of the parents think that vaccinations may cause serious reactions or the illness that the vaccine is supposed to prevent. Vaccinations do not cause any such issues. In fact, it saves the lives of the children. 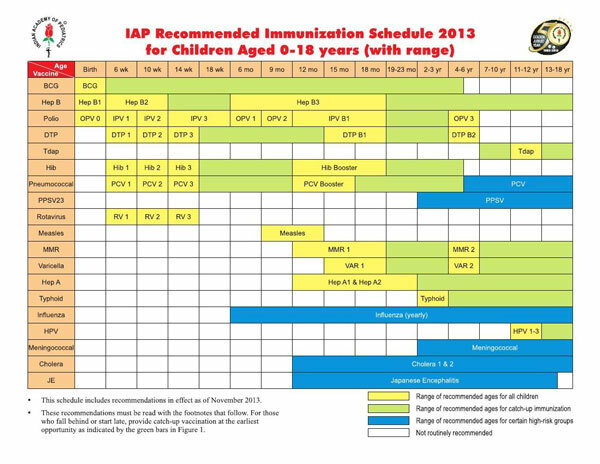 It is important to follow the immunisation schedule for the best protection.